What is an eerie and creepy setting without a healthy dose of flowing, rolling mist? 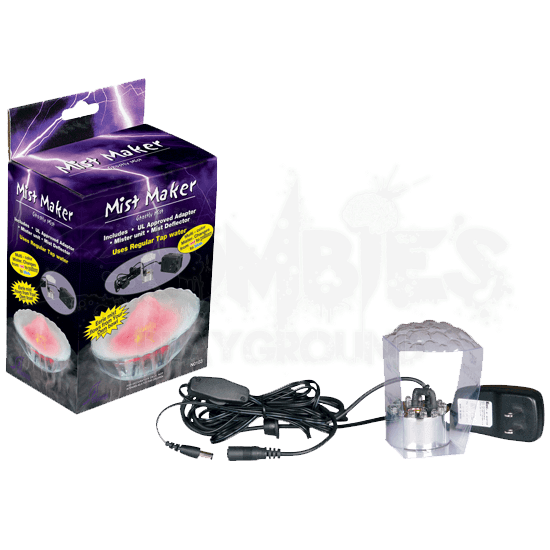 With this Mist Maker unit, you will have almost anything you need to create your own pale, ghostly mists that flow and settle just like heavy fog. This boxed unit includes a small mister unit, which requires only tap water and power to create flowing white mists. Attached to the unit is a mist deflector, which ensures that the mist spreads out. Included is also a standard UL approved adaptor, which provides the mister unit with power. The mister unit also features small lights which change colors, ranging from red to yellow to blue. In truth, all you need to provide for this Mist Maker is the tap water, the power outlet, and your own bowl, and you will be well on your way to creating a cloud of white, fog-like mist!